Driving around with a date trying to find food before a show at the Alamo Drafthouse I'm reminded of some praise for Dos Batos on the website that rhymes with "cow pound". Their thing is "wood fired" tacos. We drive into the shopping center parking lot and see a hand made sign near Conn's that says "Tacos" and has an arrow pointing to the right. My date asks what type of food they have because she's really not in the mood for tacos having already passed up the choice of trying Torchy's for the first time. "Uhh, I know when they opened they only had tacos, but I'm sure they have more than that now," I replied with false confidence. Pictures and more after the break! The inside has a clean anti-septic feel, kind of like Chipotle, and the menu is written on the wall on chalkboard paint. Much to my date's chagrin they still basically only have tacos. 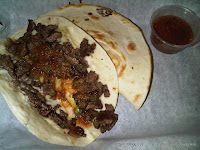 The have five different tacos of two different sizes and a pork sandwich, but unfortunately the five tacos are really the same taco, with different options. 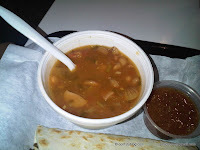 They also have a bean soup (basically borracho beans) and a kids quesadilla. We ordered three regular "Piratas" to share. 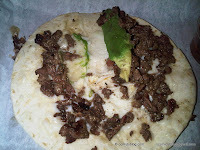 The Pirata has beef, cheese, and avocado. It was tasty, but also very simple. The beans were basically borracho beans (but they put cut up hot dog in it????) and were good also. The food was OK, and I guess I can understand how people would think this place was really great if they didn't know how to cook. The other tacos they had were all variations on the same taco, the Regio was just beef, the Menonita was beef and cheese, the Haas was beef and avocado. Taking out the "wood fired" part of the equation, the taco was just meat, cheese (probably Monterey Jack), and a slice of avocado. If you can't do this at home, you probably aren't that interested in food to begin with (or maybe you lack a good way to grill). Admittedly I'm not going to grill a ribeye steak just to cut it up and put it in a tortilla (I'm pretty sure their beef was ribeye steak), but if I really wanted to I could. The people at Dos Batos were very nice and they do put out a tasty and quality product. It seems like a nice place to get a bite to eat, more so for lunch than dinner. However it's definitely not a culinary revelation. I'm not going to hold that against the place, if I could make money off easily impressed Cow Pounders, I'd do it too. Jimbo, this is a solid review. With unbitten food pics!! Poetry snaps for you. Too bad I'm telling your wife you went here on a date. Their corn got some award from the Chronicle food whatever they are called awards. I'm gonna try and go try it when i make it up north again.